If you want to listen to Jupiter sing, bounce a message off the Moon, or bounce off aircraft, random space junk, or meteor trails, talk to a Satellite, or a little unmanned Aircraft, you need a very high gain antenna. 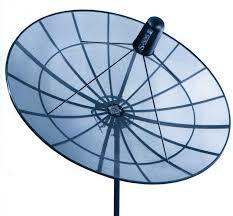 An easy way to make one, is from an old C-band satellite TV, Big Ugly Dish (BUD). Considering that the amount of space junk is ever growing, Junk Bounce Communications (TM) can only improve. An advantage of Junk Bounce is that it works at any frequency, from UHF up to K-band, so orbiting space junk could become the new ionosphere, a neat radio wave reflector around the planet! To use an unknown dish, you need to find its focal point and then make a little antenna with a good front to back ratio, to use as a feed. Measure the diameter (D) and the depth (d) of the dish. 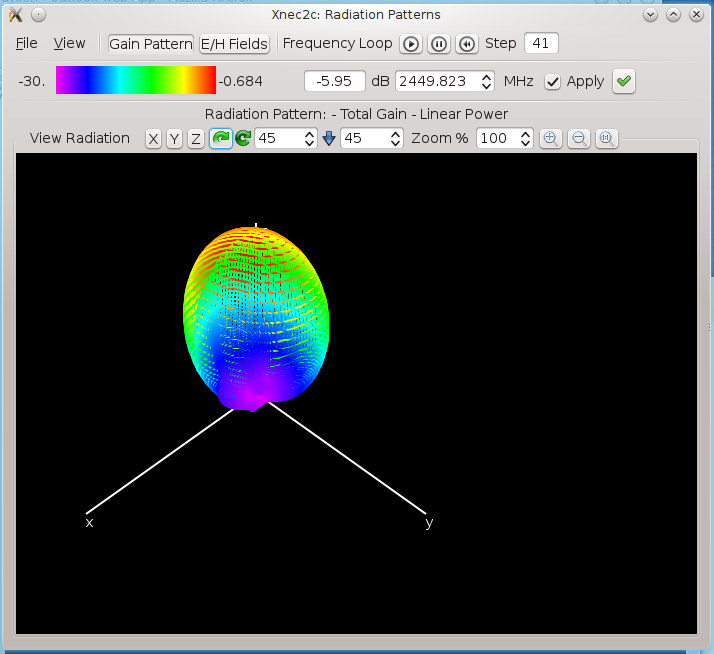 Note that an offset feed dish is only half a parabola. It is best to use a circular dish with centre feed. There are millions of these things lying around, pick a good one. When it is free, take two. Most satellites are rotating slowly, to improve their stability - the space station is an exception. This means that a ground antenna needs to be circularly polarized, otherwise the signal will fade and fluctuate, twice, with each revolution. This requires either a helical antenna, or a turnstile Yagi antenna. 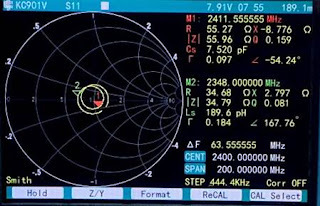 A Yagi antenna tends to have a very low impedance, while a helical antenna tends to have a very high impedance. 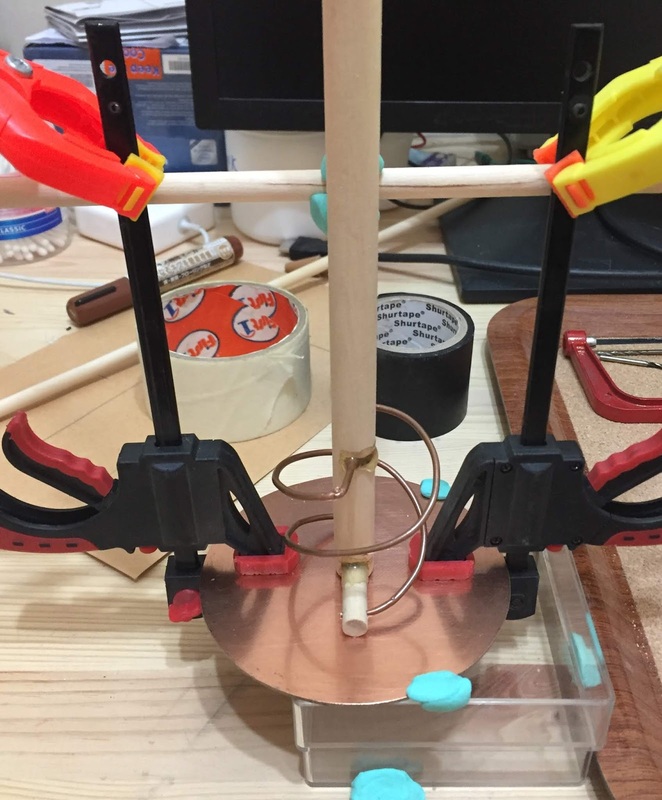 The parasitic elements of a Yagi loads the active element, much like resistors in parallel. One can use the same effect with a helical antenna, to reduce its impedance to something closer to a 50 Ohm co-axial feed cable. 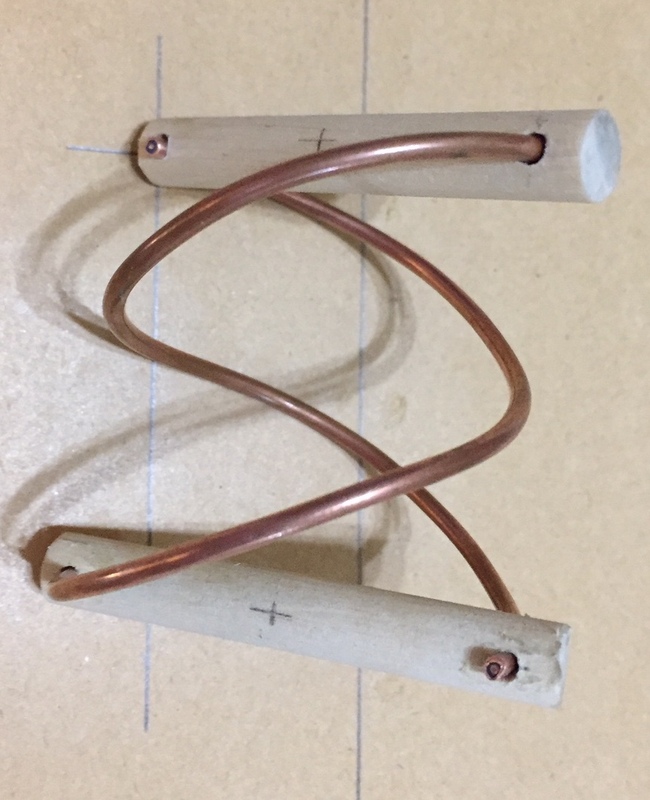 A multifilar helical antenna can be tweaked to almost exactly 50 Ohm, by driving the one filament and leaving the other ones floating, just like Yagi director elements. The more floating metal parts, the lower the impedance gets. An easy(!?) 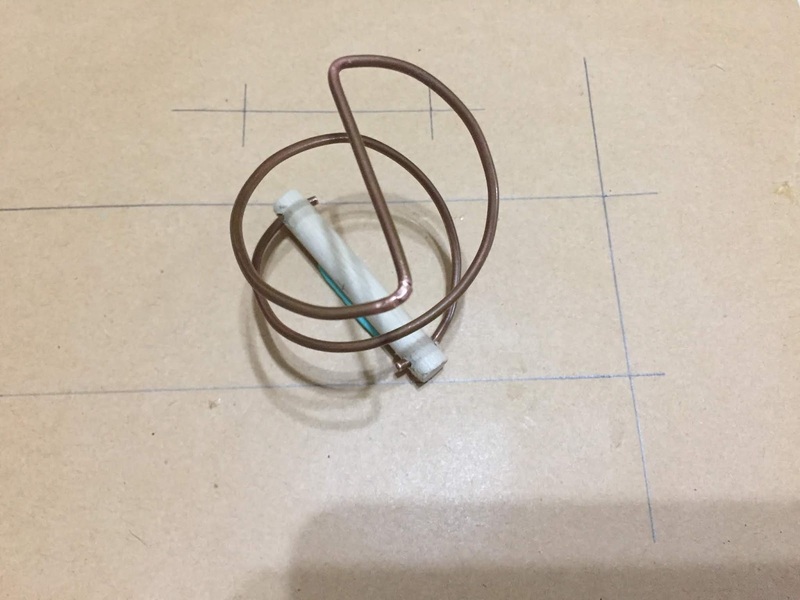 way to make a small helical feed antenna for the Industrial Scientific & Medical (ISM) S-Band is with semi-rigid coaxial cable of 2.2 mm diameter. A semi rigid co-ax is a thin copper pipe, which is easy to form with your fingers, without any resulting welts and blisters (3 mm is more stiff, but still doable, while 3.6 mm is already hard to bend and twist by hand). The reflector should be circular and about 3 times the diameter of the helix - roughly 100 mm or more will do. 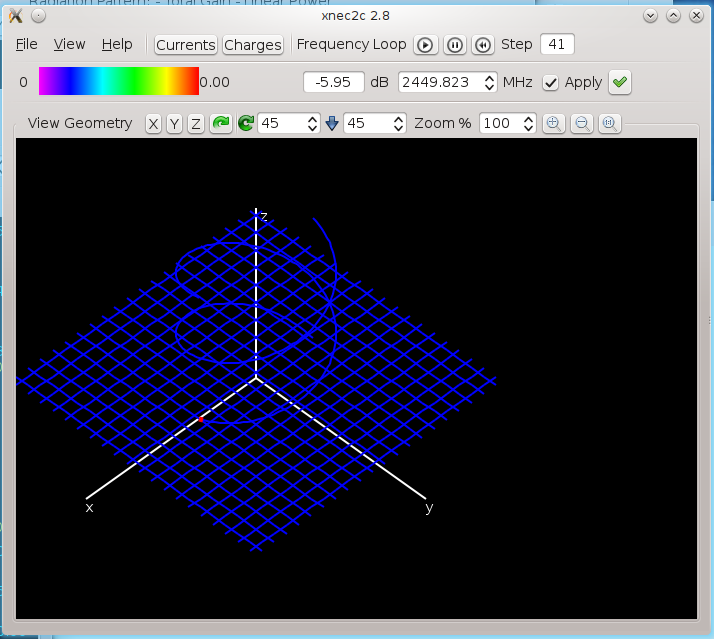 For the model, I made a square patch, 1 mm below Z = 0 - since it is easier to define in NEC. Cut two filaments with a Dremel cutting disk, grind and file the ends till they are exactly the right length and then bend them carefully into a circle. When the circle is as round as you can get it, slowly pull the two ends sideways until they are 49 mm apart. Copper recrystallize at room temperature, so take your time. If the wire turns hard - leave it till the next day - then it will be soft again. I mounted the filaments into little wood dowels and glued one to a circular FR4 PCB reflector - the bottom of a coffee tin will work too. Note that the dowels will not be parallel - the ends of the wires should line up, which means that the two dowels will seem slightly off kilter. The top cross bar could also be a straight piece of coax, since the current at that end is zero. 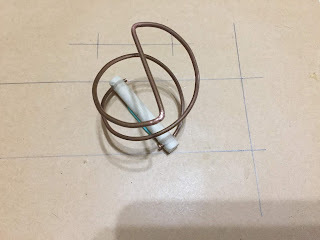 Therefore, you could make a bifilar helix out of a single piece of wire, but bending and stretching it precisely is quite hard, which tends to crack it at the 90 degree bends. I fixed the one below, with solder. Pick your poison! The outside of the one driven element must be soldered to the centre of a 50 Ohm feed line and the screen of the feed line must be soldered to the reflector. It always requires some improvisations to make a helix, which is a large part of the 'fun'. 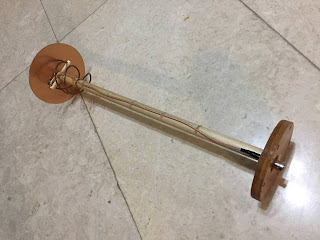 The other parasitic element will just be standing there above the ground plane, seemingly doing nothing, but it does affect the antenna pattern and impedance, so it is an important working part of the antenna. I got the dowels at a gift shop - I bought a couple of little flags, kept the sticks and discarded the flags. That was very unpatriotic of me, but flag poles are commonly used for covert radio amateur antennas! If you zoom in on the picture, you'll see that the coax goes to one end of the helix. The other end is left floating. Tie the RG316 coax to the rod with waxed nylon lacing twine (Otherwise known as Johnsons dental floss!). I glued a BNC connector into the disc. BNC is not the best for ISM microwave frequencies, but it is easy to work and experiment with. The base disc was cut from a bread board with a jig saw. I marked the hole pattern with nails lightly tapped with a hammer through the dish mounting holes. Paint the antenna feed with Conformal Coating (I used an Italian V66 conformal PCB spray), or any other kind of clear varnish to make it last a while. Do not use coloured paint, since you don't know what was used to make the pigment. If it is a metal salt, or carbon black, then the paint will ruin the antenna. An end fire helix is naturally circular polarized. This little one is RHP, but when it reflects off the dish, the phase shifts 180 degrees and it becomes LHP. So depending on what exactly you want to do with your feed, you got to be careful which way you wind it. If you get confused, get a large wood screw. A common screw is Right Handed. The helix made from 2.2 mm semi-rigid coaxial cable, has a good front to back ratio of about 6 dB and a nearly flat frequency response over the 2.4 GHz WiFi band. The parasitic element does its thing remarkably well, resulting in an impedance of 48 Ohm (inductive), which is a near perfect match to a 50 ohm coaxial line. 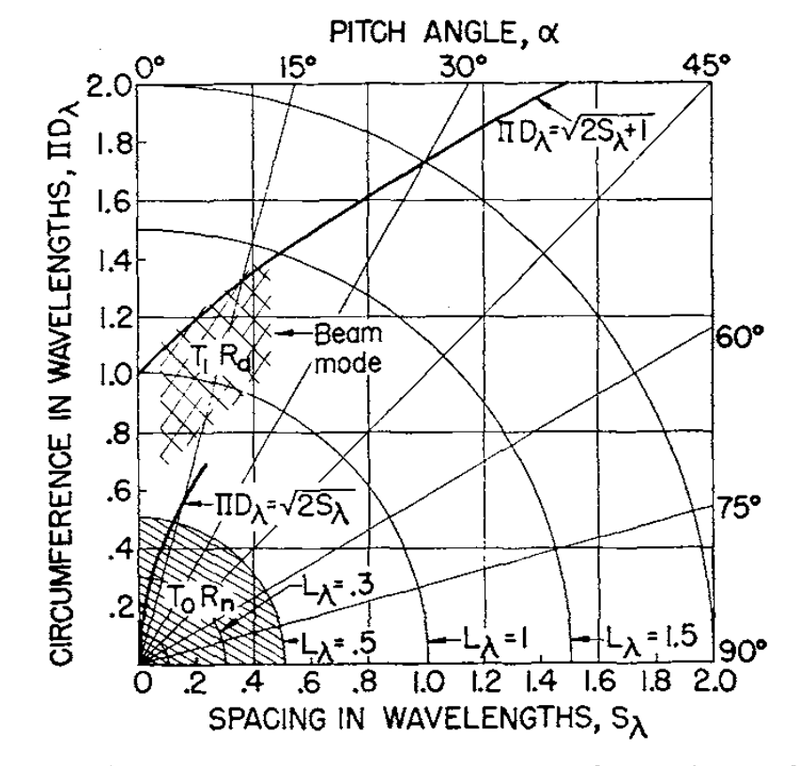 The imaginary impedance doesn't matter much - it just causes a phase shift. 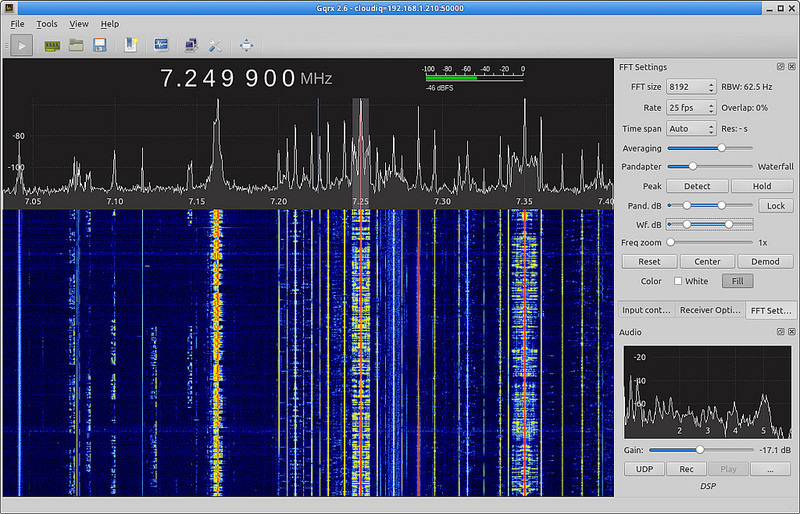 The actual antenna was measured with little KC901V, 2-port network analyzer and it looks pretty good. No additional impedance matching is required for a 50 Ohm coaxial cable. 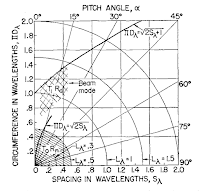 Note that the frequency is very high and the wavelength is very short. Therefore, if you change anything by as little as half a millimeter, the results could be completely different. If you want to use a different size semi rigid co-ax from your cable junk box to make the helix, then you will need to spend a couple hours tweaking the helix parameters (width and spacing), to get the impedance back to about 50 Ohm again. A corner reflector with a skew mounted dipole. A twisted Yagi antenna with the reflector, driven element and director at 45 degree angles w.r.t. each other - a discrete version of a helix. A crossed Yagi antenna, with a 1/4 wave delay line between the driven elements, a.k.a. a turnstile antenna. A patch antenna with two truncated corners. A quad patch array with each patch rotated by 90 degrees. A crossed monopole antenna, or an F antenna. There are more ways to distort the EM wave and cause elliptical or circular polarization, just use some imagination. 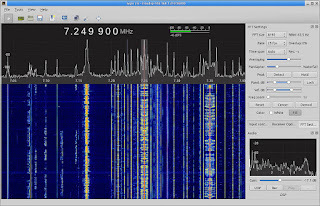 The HackRF One radio works with GNUradio and GQRX : http://gqrx.dk/ It is a very nice half-duplex radio and can tune up to 6 GHz and is good for VHF to microwave experiments. To bounce pings off space junk, you could point your BUD straight up like a bird bath and use two radios (This sure is not a cheap hobby! ), with a directional coupler (Note that the HackRF is half duplex - it cannot receive itself and for transmit, you obviously need an RF amplifier). Once you got meaningful results, you could find a ham partner some distance away to exchange pings, chirps, or short messages. 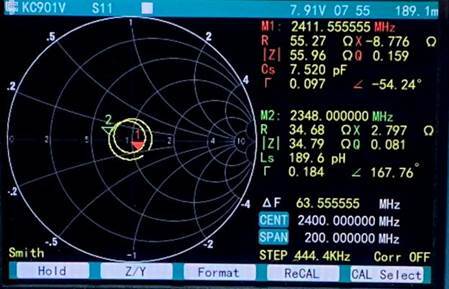 If you are very dedicated then you can track and bounce messages off the space station for several minutes on a pass. If you send a continuous stream of pings up into the sky, then you should receive an echo from a UFO every few minutes. Only an engineer will find this exciting, while the missus will pretend that it is a great achievement (She knows you are crazy and will be real happy that you are staying in your radio shack and out of her hair).